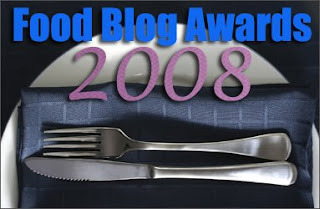 2008 Food Blog Awards: The Voting Polls Are Open! The Well Fed Network's Annual Food Blog Awards are going on now! The judges have announced the finalists in each of the 14 categories, and now it's time for you to vote. I was happy to see that some of my favorite blogs made the cut, including Organic to Be for both Best Food Blog—Group and Best Food Blog—Theme (along with the marvelous Karina's Kitchen). Andrea's Recipes—home to Grow Your Own, the twice-a-month food blogging event that 'celebrates the foods we grow or raise ourselves and the dishes we make using our homegrown products'—is up for Best Food Blog—Family/Kids. And of course I'm thrilled that my main blog, Farmgirl Fare, is in the running for Best Food Blog—Rural. The Food Blog Awards are a great way to discover dozens of delicious new food blogs. You'll find links to all the finalists and can vote in each category here. The voting polls close on Saturday January 24th at 8pm EST. Have fun! Update: Thank you! We won! © Copyright 2009 FarmgirlFare.com, the foodie farm blog where a 55 degree change in temperature in less than 36 hours has me, the animals, and the garden very confused. Enjoying the sunny warmth and the ability to walk outside without having to pile on 9 or 10 pieces of clothing first, but very confused. Never pull up a Swiss chard plant if you can help it! This easy to grow wonder green, for which I've become a rather loud champion, should not only be in every garden, but it should also always be there. Blistering heat, freezing cold, wet winter weather, dry summer days—delicious, nutrient-packed Swiss chard puts up with it all and just keeps putting out. Enjoy the young leaves in salads, or use the larger ones in place of spinach in nearly any recipe. The stalks make a delicious and colorful celery substitute. In addition, Swiss chard is a cut-and-come-again vegetable, which means that one crop can literally supply you with bounty for months. Let some or all of your plants go to seed, and you'll be able to either start a new crop somewhere else or designate a permananent Swiss chard bed where the plants will keep re-seeding on their own. The plants above were direct seeded in early spring of 2008 and show no signs of stopping anytime soon. The Swiss chard plants in the two photos above are all volunteers that popped up last spring in the unheated and uncooled greenhouse, supplying me with fresh bounty through the summer despite it being a sweltering 120+ degrees on sunny days, and then into the fall as the thermometer dipped down into the teens. I draped floating row covers and old bedsheets over the plants on cold nights, which offer good protection for the plants but at the same time subjects them to being flattened by Sylvester the cat who likes to sneak into the greenhouse and curl up on them. We have 240 acres full of all sorts of cozy nooks and crannies and yet he insists on flattening my arugula (which is another easy-to-grow green no garden should be without). Good thing he's so cute. The evening of the winter solstice found me frantically snipping back all of the Swiss chard plants in the greenhouse preparation of that night's forecast of 4 degrees with even colder temperatures the next night. To harvest, I simply grabbed the stems of each plant in my left hand and cut them off a few inches from the base with an inexpensive, large pair of scissors. This is the same way I pick lettuce (which is also easy to grow) because not only does it leave the plants in the ground, allowing them to grow back, but it's also a lot less messy because you aren't pulling up any dirt. So even if I'm planning to clear out a bed, I still harvest this way and then later go back and rip out the cut bases of plants. I covered the trimmed plants in the greenhouse with sheets and blankets, put an electric space heater in there for the next two nights, and hoped for the best. All I have to do is keep the plants alive for the next month or so, and in February they'll take off and start providing me with baby leaves for salads long before anything else in the garden (except arugula, if I can keep Sylvester away from it) is even remotely ready to harvest. Worst comes to worst, the plants freeze to death and all I'm out is the time it took me to cover and uncover them each night. But as you can see, things are already looking quite hopeful. And they'll be looking a lot prettier if ever get around to cleaning up all the dead leaves in the bed. But don't hold your breath. This is when you tell yourself you're not being lazy, you're smothering potential weeds and amending the soil. As for the several pounds of bounty I picked on the last day of fall, some of it went straight into a batch of this healthy and flavorful Swiss Chard & Artichoke Soup, which was inspired by my Hot Swiss Chard Artichoke Dip. The rest was put into plastic bags that I placed in a cooler on the covered porch off the kitchen because there wasn't room for them in the fridge. It's been over two weeks, and what's left is still looking fine. Freshly picked greens will last quite a while if kept cool and moist. So if you haven't already, why not give Swiss chard a try in the garden this year? Even if you don't have a greenhouse, unless you live in the arctic you can probably keep a healthy crop alive for most, if not all, of the year. Is there anything growing in your garden right now? © Copyright 2009 FarmgirlFare.com, the foodie farm blog where Farmgirl Susan shares recipes, stories, and photos from her crazy country life on 240 remote Missouri acre—and we're determined to make Swiss chard lovers (and growers!) out of as many people on the planet as we can.